The removal and hygienic disposal of dog waste from public and private areas, and kennel businesses. We have the knowledge, experience and equipment to fully remove nearly all types of graffiti. The licensed removal and disposal of items of rubbish as a result of illegal dumping on your land or roadside. Litter is an on-going headache. Let us solve your problems on a contract or individual basis. Customised solutions for your waste problems. Bins for general litter and specially for dog waste, plus benches and other park ‘furniture’. Superb quality. We provide a range of services to maintain the look and safety of both public and private spaces. dog waste solutions for public or private areas? the removal of fly tipping or graffiti? a general litter pick or car park sweep? hedges trimmed or grass cut? If so, we can provide you with a solution tailored to your requirements. We don't sell generic packages - just the services and products you actually need. 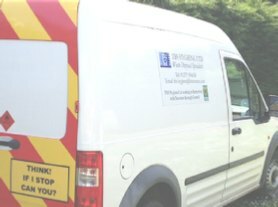 Formed in 2000, TBS Hygiene Ltd has built a reputation as a friendly, professional and reliable company for the safe removal and disposal of all types of waste, as well as the maintenance of public spaces. Some of our clients are shown above but we have many more satisfied clients. Please look at the rest of our website to see the full repertoire of the services we can offer you. 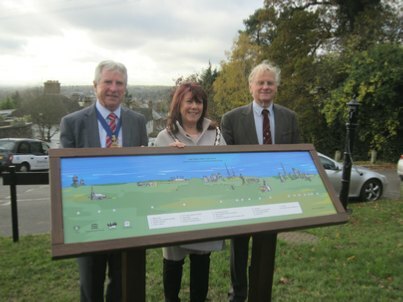 Cllr Chris Pond, Chairman of the Environment and Heritage Committee unveiling the new interpretation board at York Hill. We recently had the pleasure of working with Loughton Town Council on the preparation for the unveiling of their new interpretation board at York Hill on 12th November. To make certain that this event ran smoothly and the area looked immaculate, we were asked to ensure that the surrounding greens were free from litter. We then put in place some bollards to prevent people from parking on the greens, where we then installed the interpretation board. The board was unveiled by Council dignitaries and in the presence of the local press. All those present were very complimentary about the improvement works which had been carried out. Our services were engaged for this project because of the very satisfactory manner in which we have carried out various other works throughout the Loughton area, including bench refurbishments, the installation of alleyway signs, and the maintenance of park equipment. We were delighted to be involved with these improvement works which aim to enhance the environment and build on the heritage of the area.